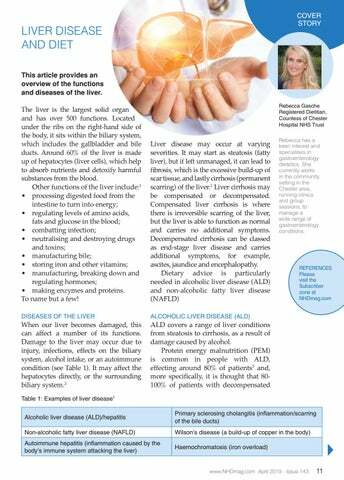 LIVER DISEASE AND DIET This article provides an overview of the functions and diseases of the liver. The liver is the largest solid organ and has over 500 functions. Located under the ribs on the right-hand side of the body, it sits within the biliary system, which includes the gallbladder and bile ducts. Around 60% of the liver is made up of hepatocytes (liver cells), which help to absorb nutrients and detoxify harmful substances from the blood. Other functions of the liver include:1 •	processing digested food from the intestine to turn into energy; •	regulating levels of amino acids, fats and glucose in the blood; •	combatting infection; •	neutralising and destroying drugs and toxins; •	manufacturing bile; •	storing iron and other vitamins; •	manufacturing, breaking down and regulating hormones; •	making enzymes and proteins. To name but a few! Rebecca has a keen interest and specialises in gastroenterology dietetics. 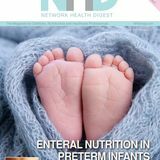 She currently works in the community setting in the Chester area, running clinics and group sessions, to manage a wide range of gastroenterology conditions.